Managing chronic pain is one of the toughest challenges in medicine. Over time, the pain can get to negatively affect all other aspects of life, and those with it suffer needlessly for years. Chronic pain treatment always starts with the less aggressive and less expensive therapies, such as painkillers, physiotherapy, TENS and nerve blocks. Some of these treatments work at first, but do not always provide a lasting relief of pain. When the pain does not respond to these less aggressive therapies, other alternatives are applied. Spinal cord stimulation is one of them. In some patients, this stimulation enables the overcoming of chronic pain and the return to a more active lifestyle. Neurostimulation of the spinal cord uses neurostimulators. These are small devices that, after being inserted in a subcutaneous pouch, generate low-intensity electrical impulses that, by stimulating the spinal cord, interfere with the transmission of pain signals to the brain. A surgical procedure is required to insert the components of the system. During this procedure, one or more electrodes are inserted into the epidural space (the space surrounding the spinal cord coverings) and connected to a small electronic device, inserted just under the skin, which generates the electrical impulses. Spinal cord stimulation does not cure, so it is unlikely that it will completely eliminate the pain. Its purpose is to reduce severe chronic pain as much as possible, but the degree of pain relief varies greatly from one person to another. This treatment for chronic pain has a low risk of complications. 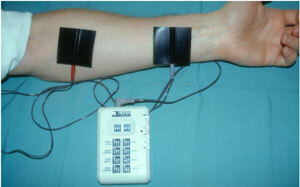 These include the loss of effective stimulation due to displacement of the leads, the loss of stimulation due to a failure in the electrical signal generator, the displacement of the area of stimulation covered by the neurostimulator, over-stimulation, loss of the pain relief effect, or allergic reaction to one or more components of the system. The effects of spinal cord stimulation in pregnant or breastfeeding women are UNKNOWN. Spinal cord stimulation is especially effective when treating chronic neuropathic pain, which occurs when nerves or the nervous system are damaged. To maximise the benefits of spinal cord stimulation, the patient must be willing to co-operate. You should spend some time learning how the neurostimulator works and follow strictly its instructions of use. Once the surgical wound heals, most patients report that they often forget that the implanted device is there. You can still feel some discomfort while the incision is healing, but it is a normal process that indicates that the healing process is underway. Depending on the size and shape of your body and on the implantation site, you may be able to feel the electrical signal generator (very thin people will be able to feel it more). We will discuss with you which is the most convenient and cosmetically appealing place for the implantation of this device.